Our Simply Elegant Cake Option offers a elegant, but, economical option. We are NOT the traditional cake makers, bakers or designers. We offer "Rental Cake Alternatives" for those who are looking to have "THE LOOK" and not the cost! 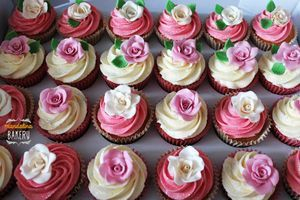 That is, we have faux cake alternatives that are decorated with the same materials as traditional cakes, but not edible! Shhhhhhhh!!! No one will ever know! 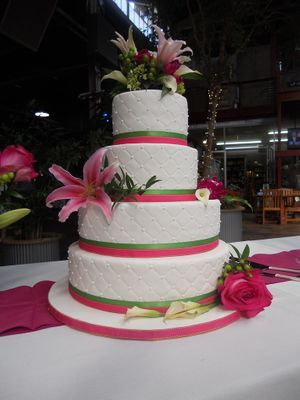 Now, you can have that "Gorgeous" cake design, but not the price. You will be happy to know that with a special compartment you will be able to do your traditional cake cutting ceremony with this cake. In essence, "have your cake & eat it too"! 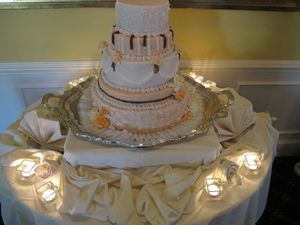 ~ You can have a Gorgeous Wedding Cake AND a great tasting sheet cake for your guests. (We offer this sheet cake FREE with this option. We have a variety of options as upgrades: Cupcakes, Your Anniversary Top Tier, Specialty Cake Flavors Available and more! Click Here to Be INspired!! !